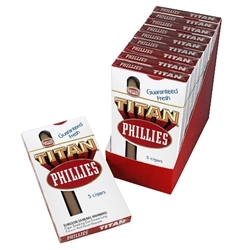 Phillies Titan Cigars are a mild-bodied smoke that doesn't compromise on quality. Measuring 6 1/4 inches in length, with a ring gauge of 44, these cigars have gained in popularity among both occasional and regular smokers for their impeccable blend of Dominican and Honduran tobaccos, giving them a smooth and decadent flavor with a wonderful aroma. Every Phillies cigar has a mild and consistent burn that enhances the taste and provides a pleasant smoking experience. Try a Phillies cigar today here at Smokers Discounts!